Looking for high-caliber zinc alloy casting services? You’re right where you should be. At Patriot Foundry & Castings, we specialize in producing world-class sand castings of a variety of zinc-based alloys. Zinc is known for its strength, durability and its ability to be cast into a myriad of shapes. Unlike most foundries, most of our alloy castings include multiple materials. We routinely pour around heating elements, copper tubing, cast iron parts and steel inserts, among other things. 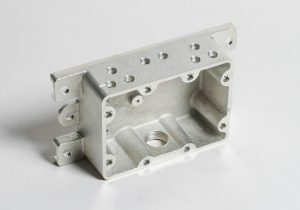 We also offer value-added services to complement our zinc castings, including pattern design/production, heat treating, annealing, machining, powder coating, painting, anodizing and assembling for completely finished parts. We are proud to be ISO 9001:2008 certified (certificate number 11-2168). Our DUNS number is 826918117 and our CAGE Code is 54J41. Assembly analysis/casting integration: We’ll work closely with you to identify opportunities to save costs. We recently saved one client 60% in production costs; with our help, the customer could recoup its tooling costs in less than two years. Reverse engineering: Harnessing cutting-edge 3D scanning technology, we can accurately replicate a part that’s been created elsewhere. We can analyze chemical and metallographic properties to pinpoint materials and post-production techniques used. Zinc prototypes: We produce fully functional zinc prototypes as well as non-working ones, which are useful in presenting to stakeholders, potential investors and test market panels. Learn More About Our Zinc Casting Services! Contact us today for a free initial zinc alloy casting consultation. We’re based in New Hampshire, but provide services throughout New England, Greater Boston, Massachusetts (MA), Vermont (VT), Rhode Island (RI), Connecticut (CT), Maine (ME), New York (NY), New Jersey (NJ), Pennsylvania (PA), Delaware (DE), Maryland (MD), Virginia (VA) and all of the U.S.